The West Cork Junior B Football Championship Semi Final was played on Friday 10th of August at Ahiohill.Bandon were very poor in the first half and were deservedly trailing 0-8 to 1-9 at half time.Inspired mainly by the switch of Darren Crowley to full forward, Bandon really kicked on in the second half and coped much better with the Randal Og's runners Bandon scored 1-11 in that second period and limited their opponents to 1-1 with that goal coming at the death.Bandon now await Goleen in the West Cork Final at tbc.Team Jack Donegan, Mark O'Regan 0-1, Kevin Lucey, Colm Fogarty, Andrew O'Connell, Joe Harrington, Shane Hayes, Rob Long, Rory Fogarty, Darren Crowley 0-11, David Ahern 0-1, Aidan O'Mahony, Eoin Nolan 0-2, Michael Cahalane 0-3, Robert Moloney. Subs : John O'Connell 1-0, Ciaran McCarthy, Gavin O'Connell 0-1, James Daly. Team, Pat Prendargast, Joe Harrington, James Walsh, Philip Crowley, Timmy McCarthy, Andrew O'Connell, James O'Donovan, Matthew McNamara, Eoghan O'Donovan, Darren Crowley 0-1f, Pat Barry 0-2f's, Michael Cahalane 0-1, Cian O'Mahony 0-1, Adam Murphy 2-6, Mark Sugrue 0-2. Subs: James McSweeney, Rory Fogarty, Ciaran McCarthy. 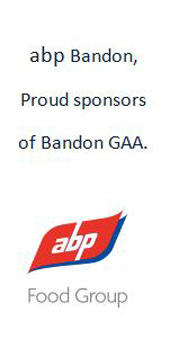 RedFM Senior Hurling League Bandon 2-18 Killeagh 3-19 on Friday 17th August at Charlie Hurley Park. This was truly a game of two halves with Bandon in almost complete control in the first half and a very pale shadow of themselves in the second half. We led 1-14 to 0-5 at the break and seemed home and hosed but maybe the team thought the same because we faded completely in that second period. Everything seemed rushed from puck-outs to the forwards and the wrong options were the ones taken most times. Some players seemed to run out of steam but maybe that is because we are in reality limited to about 17 outfield players and we don't seem to have a strong bench to select from or maybe we don't want to bring them on either and then they have no way of improving. I don't know what our many neighbours from Newcestown thought of it all but it is to be hoped that we don't fade out as much at Clonakilty on next Saturday week again the same opposition in Round 3 of the Senior Hurling Championship at 6pm or we could all stay at home. Before all that excitement we play Ballymartle in our final senior Hurling League game at home on this Saturday 25th of August at 7pm. Failure to win will push us nearer the relegation trap door but we live in hope. Team, Pat Prendargast, Joe Harrington, James Walsh, Philip Crowley, Donough Lucey, Andrew O'Connell, James O'Donovan, Eoghan O'Donovan, Darren Crowley, Matthew McNamara, Pa Barry, Michael Cahalane, Cian O'Mahony, Adam Murphy, Marc Sugrue. Subs: Timmy McCarthy, James McSweeney, Ciaran McCarthy.